If you are out celebrating this Cinco de Mayo, we encourage you to have a plan for how you’ll get home safely. You can designate a sober driver, arrange to have someone pick you up, or hail a cab on us. 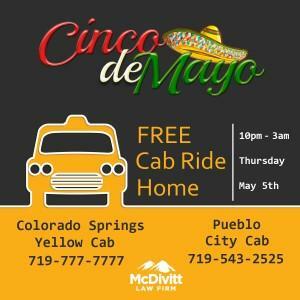 The firm will pick up a tab for any Yellow Cab ride in Colorado Springs or City Cab ride in Pueblo, as long as the passengers are headed home—the free ride is not available from a bar or restaurant to another drinking establishment. The Safe Ride Home program is for adults who have been drinking or who don’t have another safe way home. Rides are provided to an individual’s residence—not to other drinking locations. Due to the high number of ride requests on Cinco de Mayo, rides cannot be guaranteed for everyone who calls; however, every attempt will be made to accommodate all requests. Drivers have the right to use their discretion when accepting fares. Patrons are reminded to tip their drivers accordingly. Cab rides will be provided within the city limits of Colorado Springs. This includes Fort Carson, Cimarron Hills and Stetson Hills. However, Falcon, Monument, Woodland Park, Black Forest and points south of Mesa Ridge Parkway etc. are not included. The Team at McDivitt wants to remind everyone that decides to celebrate this Cinco de Mayo to do so safely. That means if you plan to drink either have a designated driver, or please take a cab home on us. Let’s remember to drink responsibly, and keep our streets safe.